In 1990, Nusrat Fateh Ali Khan collaborated with Michael Brook and released an album called Mustt Mustt. [You might know Michael Brook as the guy who invented the Infinite Guitar which was used for the haunting notes on U2’s With or Without You] It combined a traditional Qawalli style song with guitar and produced a new kind of sound. The title song of that album was a big hit and inspired Massive Attack to remix it. This remix of the song became a smash hit and reached an even wider audience. I was unaware of this song until 1996 when it was used in a Coca Cola commercial during the Cricket World Cup. It was an interesting ad and the sound went really well with it. After I saw the ad, I tried to find out what this song was called (no SoundHounds or Shazams back then). Eventually I found the song through a friend who let me “borrow” the MP3. 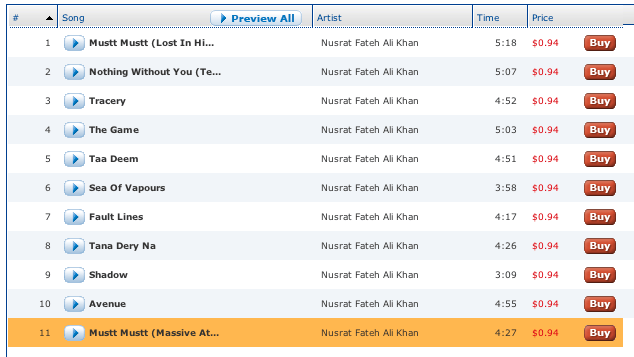 The file name on the song I got said ‘Nusrat Fateh Ali Khan – Mustt Mustt (Massive Attack Remix).mp3″. I had no idea that Massive Attack was actually a band and assumed it was some fancy name given to the remix. But I enjoyed the song and … that’s all that mattered. Over the years I lost the song and was recently trying to find it again. I tried searching on iTunes and was happy to find it in the appropriate album. $0.99 later I had the song on my iPhone and was playing it. It sounded like that song but at the same time there was something different about it. It seemed like the percussion lacked the punch, there was less reverb and overall the song felt flatter compared to how I remembered it. After a week of occasionally hearing it and not being able to put my finger on it I went back to see the album listing. There were two songs that had a similar name. One was called “Mustt Mustt (Lost In His Work)” while the other was called “Mustt Mustt (Massive Attack Remix)”. I confirmed that I had downloaded the latter. However, then I noticed that both the songs had the exact same duration 5:18 minutes! I found that a little odd so I decided to hear the 30 second song preview for the first song. And I was shocked – it sounded exactly the same as the second song. They don’t have the Massive Attack version so they simply copied the original and renamed it, offering it as a separate download? Here’s the song that iTunes was selling as two different songs. 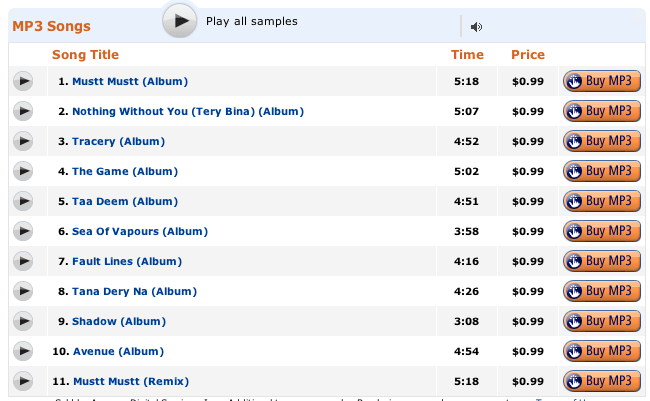 I felt cheated and decided to find the song I was looking for, so I went to Amazon MP3 and looked for the same album. Guess what, they had the exact same song listing with the two versions of the song with the same duration. So finally I decided to look at Walmart MP3 and found the same album. But this time, the two songs had different durations. I heard the preview and it sounded different so I went ahead and downloaded it. It felt great to finally hear the song as I had heard it a long time ago. It’s funny that I found Walmart to be the most trustworthy source for finding the right song. And, of course, it was $0.05 cheaper than anywhere else. Here’s what that song sounds like in this Youtube video. As WC fever is gripping me(South African – Pakistan fan) I was being nostalgic.I was looking up the coke ad as I have just read a story about the late Nusrat ali Khan ‘s son troubles in India.In 1996 I was fortunate to watch the WC in Pakistan.I was introduced to the late Nusrat’s music through the ad.I was so honored to have met him and heard him play live.Tonight I wanted to hear and see the ad just to put me back in the subcontinent with cricketfever being so high! fyi, massive attack did at least 2 different remixes–the one you know and another longer one called “duck pond dub.” it’s longer and a bit “trippy-er,” as “dub” might imply. Thanks for that information. I am going to look for that track.